BMUFOR Note #1: This article is written by an anonymous guest author. He is a former Meier-supporter, and recently stumbled upon the revelation contained herein. The views expressed here by the guest are not necessarily those of BMUFOR. As BMUFOR and others1 have now comprehensively dismantled the “higher standard of proof,” FIGU seems to be increasingly positing a new “best proof” for the authenticity of the case. Namely, FIGU proponents suggest Meier’s spiritual teaching is so uniquely percipient, so unparalleled in its brilliance, that this in itself is definitive proof that Meier is indeed what is claimed of him. In my opinion the best proof of the genuineness of the Billy Meier case is what’s written in his many books, the ones about spiritual teaching topics and life. The logic in it and the ring of truth etc. are proof enough… With “proof enough” I mean you have the “best proof” about Billy’s paramount knowledge in spiritual teaching matters when you read his books. …when reading Billy’s many books about the spiritual teaching, psychology etc., a normally-thinking human being cannot avoid to realize that one is reading the truth in the form of “That’s exactly how it is”. And then you also realize that you have found THE truth and that “Billy” Eduard Albert Meier is really the prophet of our time and the leading expert when it comes to the spiritual teaching. The time-honoured and for the first time disseminated ‹teaching of the true prophets› in written form by him, solely and exclusively explains the facts of the universal reality and the thereout resulting truth, which can be defined as ‹certainty in recognition of reality›. Of all Billy’s uniquely personally helpful books begging to be translated, the Might of the Thoughts was decided upon as THE book to [translate] first, simply because a working knowledge of the contents of this particular book provides the golden key, for those who do not have access to the German language, to all his other works. In short, it does this by teaching us how to think…[Billy] leads his readers into a fascinating territory which has, until now and for all of recorded history, been covetously concealed from us by the religious, political, social and cultural powers-that-be being the enslaving, misogynistic and disempowering minions of the Bafath, also known as the Giza Intelligences – the ancient, malign, extraterrestrial string-pullers (arrested, deported and imprisoned by the armed forces of the Plejaren Federation in May 1978) of our own fellow Earthlings we know as the ruling/untouchable elite, also known as the “money powers”, or the “High Cabal” (to use Winston Churchill’s term), and so on and so forth, or, to use Billy’s own term for them in The Goblet of Truth, simply the “Order of Darkness”. They will NOT like this book! Note that Frehner’s argument is questionable right from the outset (to put it mildly). Certainly, devout ones have claimed that the Sermon on the Mount, for example, itself bears testament to the divinity of Christ and the dogmas of Christianity. Or, that the seeming profundity of Siddhartha Gautama itself bears testament to his Buddhahood and the dogmas of Buddhism. (And, to be sure, while the existence of Buddha’s and God-Men is dubious, the claims made of Meier, as seen in the introduction, represent at least an equally difficult pill to swallow). But, no matter how elegant and ostensibly profound a message is, it says very little about the messenger beyond his/her ability to deliver an elegant and ostensibly profound message. Nevertheless, if Meier’s teaching is truly unique—indeed, having “until now and for all of recorded history, been covetously concealed from us”—then perhaps Frehner’s claim might remain viable in some small, tangential way. But, as it happened, this author recently stumbled upon something which completely discounts this ‘special-message-proves-specialness-of-author’ argument as it relates to Meier. While perusing As a Man Thinketh by the British author James Allen (philosophical writer known for his inspirational books and poetry, and as a pioneer of the self-help movement) certain passages in the book sounded incredibly familiar. Had I better recall, the entire book should have in fact sounded familiar. Without further ado, to discover why I had to pick my jaw up off the floor after reopening Meier’s ‘Might of the Thoughts,’ please view the links below. Divided by chapter, together the links below contain the entire text of the 1913 ed. 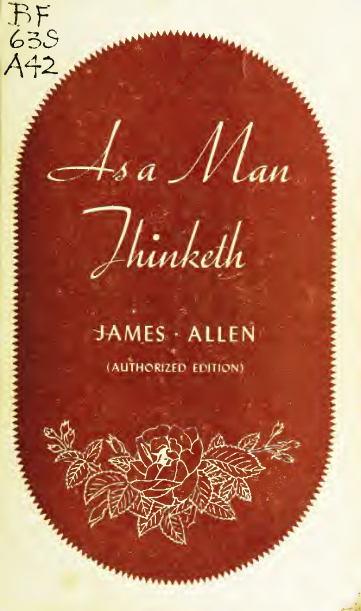 of ‘As a Man Thinketh,’ (originally published in 1903). The text is interspersed with passages from the 2012 German-English bilingual edition Might of the Thoughts, originally published by Billy Meier in German in 1998 under the title – Macht der Gedanken. Allen’s text is in blue, and Meier’s in black. (BMUFOR note: The reader will notice that FIGU chooses to carry over a handful of certain German terms into the English text, stating that these particular terms have no precise English counterpart. The meaning of these words can be found here). Billy has left his supporters no outs here. There is clearly nothing “coincidental” about the above. The bulk of Meier’s ‘Might of the Thoughts’ decidedly represents a gross—indeed, virtually complete—instance of intellectual property theft. Paragraph after paragraph, page after page. The same order, the same concepts. The same analogies, the same examples. Often the exact same language, always the exact same meaning. The table below shows which portions of Meier’s ‘Might of the Thoughts’ were taken from which respective chapters in Allen’s ‘As a Man Thinketh.’ (It is presently unknown whether passages in ‘Might of the Thoughts’ which do not have a counterpart in ‘As a Man Thinketh’ are in fact original to Meier or were likewise stolen from other authors). Meier did not even shy away from appropriating Allen’s foreword. Why would Meier, the supposed “universal prophet” embodying a 9.6 billion year old spirit-form, feel the need to plagiarize? Plagiarism, of course, is a big deal. It is safe to say an academic would never work again following such an egregious act of plagiarism. It remains to be seen whether FIGU wishes to continue positioning Meier as the “prophet of our time.” Hopefully, FIGU will, in the least, have the basic integrity and respect for its own professed principles and cease publishing blatantly stolen material. Having now dismantled the “best proof” (after having dismantled the “higher standard of proof”), the implications here are far reaching. Michael Horn often fervently argues that Meier should be given the benefit of the doubt concerning any “discrepancies” in the evidence, given Meier’s alleged “impeccable character.” Now that Meier’s character has been revealed as quite peccable, hopefully the countless other smoking guns in the evidence, which have long been rationalized away by FIGU supporters (using ‘rationalized’ very loosely), will alas be accepted for what they always have been: definitive proof Meier is a hoaxer and charlatan. It is currently unknown whether Allen’s estate plans to take legal action against Meier and FIGU for profiting off Allen’s work. (BMUFOR note: We will add an update to this article should we hear of any developments regarding the legal action). 1 See the websites – Billy Meier UFO Case, Top Secret Writers and Exposing PseudoAstronomy. 2 Gmail correspondence between Mahesh and Christian Frehner, dated January 29 and 30, 2013. 3 Might of the Thoughts, page xxi, Billy Meier, 1998/2012.